Copy photograph of a sweatshop poster showing a woman breastfeeding a baby while sewing a garment on a sewing machine. The text reads Sacred Motherhood, and the initial letter is in the shape of a dollar sign. The poster was made by Luther Bradley and probably photographed in Chicago, Illinois. 1907. What do you think about this poster? It’s mind boggling that approximately 100 years after this was shown in the Chicago Daily News, you could still publish it today. All you’d have to do is take the mother out of the sweat shop and seat her on a park bench with all eyes on her and her baby — some adoring, some glaring. 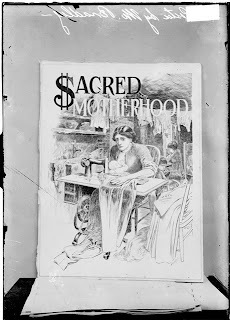 “Sacred Motherhood” still fits, but without the dollar sign. Congratulations to Barstow Community Hospital for becoming the 58th Baby-Friendly hospital in the United States. Want to know more about baby-friendly hospitals? Click here. 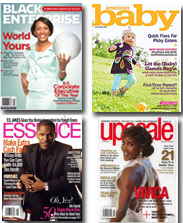 News out of Canada reports that women breastfeed longer when they have longer maternity leave. This makes sense especially since we know working is not conducive to breastfeeding moms. Plus, a Swedish study says if a mom breastfeeds for more than 13 months, she has a reduced risk of getting rheumatoid arthritis. By the way, I’ve reached a milestone of sorts. Today is my 100th post. Yeah!